NEW Gas Sample Cooler TC-Double+ by BUHLER | what we think. 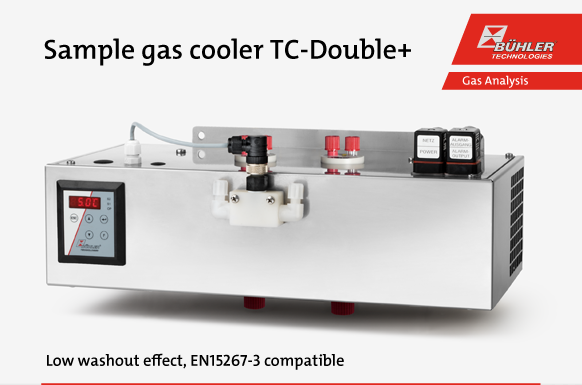 We are proud to present you another new product: the NEW Gas Sample Cooler TC-Double+. © Copyright Elemental Analytics (Pty) Ltd. All Rights Reserved. Contact us today for further information on our services or product offering. The SERVOFLEX Micro i.s is a single component Intrinsically Safe Portable Gas Analyser that is certified to zone 0 and zone 1. This unique analyser is certified to zone 0 without the need for purge. Suitable for measuring % levels of Oxygen, Carbon Dioxide and Carbon Monoxide. All sensors use non-depleting technologies, maximizing availability and reducing maintenance and operating costs. Oxygen – a choice of two Servomex paramagnetic transducers (standard or high accuracy) both offering fast selective measurement of oxygen without the disadvantages of electrochemical or zirconia cells. Carbon Dioxide and Carbon Monoxide – Single beam, single wavelength infrared technology using Servomex patented long life source gives a highly stable, selective and low maintenance measurement. Paramagnetic and Infrared sensors give reliable, accurate results with low maintenance and running costs. Intuitive interface developed with customers to ensure desirable functions and ease of use. Optional sample conditioning kit available for pumped unit. Puzzled by Which ICP-OES is right for you? No Need to be! Leeman labs offers the widest configuration of ICP spectrometers to fit any applications! In 30 years of supplying ICP Spectrometers, we’ve learned no one ICP-OES is ideal for all applications. That’s why Teledyne Leeman Labs offers you the broadest range of ICP Spectrometers available. Let us help you select the best instrument configuration for your sample types. All our ICP Spectrometers are available in Radial, Axial or Dual View Configurations, so you can choose the view that’s best for your sample matrix. Mercury When the concentration of mercury needs to be measured, laboratories all over the world turn to Teledyne Leeman Labs for high performance solutions to their mercury analysis challenges. To help you select the right mercury analyzer for your application download the Mercury-at-a-Glance Comparison Guide and find out which mercury analyzer is the perfect fit for your laboratory needs. When the concentration of mercury needs to be measured, laboratories all over the world turn to Teledyne Leeman Labs for high performance solutions to their mercury analysis challenges. To help you select the right mercury analyzer for your application download the Mercury-at-a-Glance Comparison Guide and find out which mercury analyzer is the perfect fit for your laboratory needs. Pump almost anything! Teledyne Isco syringe pumps give you precise, reliable metering for an incredible range of applications. You’ll easily handle viscosities from liquefied gases to tar, flow rates from sub-microliter to 400 ml per minute, and pressures to 30,000 psi (2068 bar). Use these rugged, do-anything pumps to solve your toughest fluid delivery problems, from micro-flow to scale-up and pilot plant, pumping corrosive liquids, and safe operation in explosive atmospheres with the HL Series. Isco’s programmable multi-pump controller interfaces easily with your system, and provides great versatility with single pump independent mode, dual pump continuous delivery or receive mode, and several three-pump control modes. Teledyne Isco: The Teledyne Isco Chromatography product line includes instruments and accessories for purification of organic compounds in normal-phase and reversed phase separations, and for bio-purification of proteins, peptides, and other biopolymers. Teledyne Isco CombiFlash® systems meet the high-productivity needs of organic and medicinal chemists. Performance and peace of mind. Providing scientists with reliable LC collection for over 40 years. Density gradient centrifugation is used for the gentle isolation of cellular ribosomes, RNA, DNA, and organelles. These unique density gradient systems automate the preparation of gradients, and the fractionation and UV scanning of zones after the spin. Choose the system that meets your automation needs. Picarro is a leading provider of solutions to measure greenhouse gas (GHG) concentrations, trace gases and stable isotopes across many scientific applications, along with the energy and utilities markets. Dopak – The Dopak SRS offers the ability to recover a liquid sample from the sample bottle without the risk of spillage or contamination. Applications for this system can be found in plant laboratories. The unique design offers a one handle operation by multiple valves. In addition, the nitrogen purge not only assists in driving the liquid out of the sample bottle, but also cleans the whole system including needle assembly and sample bottle. GO Regulator is a leading designer and manufacturer of standardized and specialty pressure regulators, diaphragm valves, and filters for the Analytical, Instrumentation, Petrochemical, Oil & Gas, and Specialty Gas industries. GO regulators and valves fulfill a wide range of applications, controlling pressure while accommodating low to moderate flow rates of many gases and liquids. A broad range of pressure regulator requirements can be fulfilled by the complete line of time proven GO fluid control products. GO regulators provide back pressure regulation for high-pressure, high sensitivity, sub-atmospheric applications, as well as vaporizing regulation for LNG and cylinder pressure regulation. HOKE is the logical choice for fluid control solutions for orifice sizes typically up to 2”. With the lowest cost of ownership, the best in class reliability and global distribution assuring availability of products, HOKE valves and fittings are unmatched. In the early 1960’s, HOKE introduced the GYROLOK® tube fitting. To this day, GYROLOK design features offer unique advantages and benefits that are unmatched in the industry. Through years of experience, HOKE understands that precise flow control is a complex thing, not a commodity. At HOKE, the approach is to focus on the whole process in order to satisfy all requirements of the end-user. Air Dimensions Incorporated has more than 60 years of combined experience in the development, engineering and production of precision gas sampling diaphragm pumps and compressors. Each of our durable Dia-Vac® pumps boasts completely oil-free, contamination-free and leak-free sampling capability. Unsurpassed quality, personal customer service and expedited delivery all combine to make ADI the leading authority in the diaphragm pump industry. When a pump goes down, we know that replacement parts or a completely new pump must be dispatched as quickly as possible, and ADI stands ready to get the job done. We have a track record for making on-time deliveries no other pump manufacturer can match – it’s something we are proud of. It’s something you can rely on. Headline Filters produce a wide range of products for the filtration industry, from filter elements, for coalescing or particulate duty, in a wide variety of industry-standard sizes to filter housings in a variety of materials for pressures up to 700 bar. To complement these products, we also offer a range of Membrane Separator housings for those applications requiring zero liquid entrainment. Also available are disposable inline filters which offer the user a cost-effective and easy-to-replace robust filter suitable for portable analyser systems. Headline Filters also produce adsorption products in a variety of forms, ideal for last-chance air purification and analyser protection. Disposable types eliminate the need to handle loose adsorbents although re-fillable versions are also available. Many different adsorbents are available to cater for virtually all requirements. These filters are suitable for a variety of gas and liquid applications. The disposable bonded microfiber filter elements are extremely efficient as well as being low cost. They offer high flow rates with very low pressure drops. All products conform to industry standard sizes and grades and are completely interchangeable with other manufacturers housings and filter elements. The comprehensive product range enables greater flexibility for customers because of the greater choice. The development of new products is customer driven, with our engineers working closely with OEM customers and end-users. Special housings and filter elements developed to meet specific customer requirements and specifications are available. A global distributor network, that includes all of Europe and the USA, South East Asia, Australia and South Africa, offers unbeatable delivery times and service. Along with over 29 years of experience & expertise all standard products are kept in stock.